Who I am: ex worship leader / lifelong "Christian" of 18 years, now agnostic. Why I ask: If God is the way I am about to describe (unjust from a human perspective), why follow him? From my understanding, the belief that God has predetermined those who will receive salvation is one held by many Christians, and in my experience has been mostly Christians with a Calvinist theological perspective. This is what I mean by predestination: The belief that God has chosen/ predetermined those who will spend eternity in heaven with him and while not choosing others. In doing so, he has intentionally NOT chosen some to spend eternity with him. Here is the problem. According to the Calvinists I have talked to, because of our sinful human nature that we've had since the fall, we are not deserving of heaven/ God's presence. For example, if a child is born and dies the following day, its spirit will go to hell due to its sinful nature. Another example would be a person who has never accepted the gospel because they never heard it. Even if they have heard it, certainly no two people have had an equal chance to receive salvation (i.e. a pastor's son and a child raised in an atheist home). This is not even taking into account whether or not God has chosen them for heaven. In no way are these things just from a human perspective. However, if this is the case, then there are both uninformed adult and newborn souls in hell who never had a fair opportunity to receive salvation (by a human standard). Why would anyone desire to be in the presence of a God who does not show mercy to certain people? It seems to me as though it would only be to escape the punishment of hell. Please correct my misconceptions of this viewpoint or explain it is that God is just in this context. I think the issue here is that you are trying to examine one point of doctrine outside of the context of the whole system of doctrines that it fits into. If you take the Calvinistic doctrine of predestination by itself and tack it on to a generic pseudo-protestant view of salvation, you'll end up with a problem such as the one you describe. God becomes unjust because your definition of justice is supported by a theological framework that Calvinistic theology would say is a broken framework. Even as a Calvinist I can see how people who try to examine a specific doctrine such as predestination can conclude it to be nonsensical or even offensive. However that is not the end of the story. In order to judge such a doctrine, you must consider it in the context of all the same presuppositions and other related doctrines. This will be a very simplistic outline of some issues that need to be brought into the discussion rather than a full treaties on the issues, but I hope it helps provide a starting point. First of all, predestination cannot be considered without also resolving the issue of original sin. According to a Calvinistic interpretation of scripture, the idea of original sin when traced through all of scripture paints a picture of man as totally depraved: in other words he will not (and cannot) on his own volition and power act or choose anything that is truly good in God's eyes. It's a hard pill to swallow because man's prideful nature always wants to defend himself to the last; yet I have come to believe this is both the true nature of all men and exactly the picture Scripture paints of him. This leaves us with an unsettling conclusion quite different from the one you pose in your question. If the doctrine of total depravity is to be believed, no man on earth would ever, given an opportunity, voluntarily choose to follow God or believe in Christ as savior. The only just thing for God to do with such rebellious prideful people is to destroy them. This creates a whole new problem. Suddenly God is not unjust for not saving some, he is unjust for saving any at all! The problem with justice, for a Calvinist, comes at the point of "unconditional election", whereby God opts to save some in spite of the fact that they have fulfilled no condition for deserving salvation such as believing or doing works or whatever. Now the Doctrines of Grace are starting to all play off of each other! The problem of injustice -- that God would knowingly justify (make right) and acquit somebody who themselves had done nothing but wrong and of whom justice would demand punishment -- is resolved in the propitiatory act of Christ where somebody who had done no wrong and justly deserved life was "made sin" and put in our law place and punished on our behalf. Whose law place did he step into? Again according to the same set of interpretations one must understand Limited Atonement, or the idea that Christ choose to be the atonement for a specific set of people, his chosen. In a very real sense this choice is arbitrary because those people did not do anything specific to deserve it -- hence we cannot boast in any choice or act of our own but only in Christ who rescued us -- but it is not unjust for him not to choose other than he did. The alternative is that he died in an attempt to save more, but was ineffective in so much as it only "worked" for some people who had enough good sense to recognize the value of his work of their own accord (an idea ruled out earlier by Total Depravity). The system can be rounded out with the other doctrines such as Irresistible Grace where God does not fail to lead those he has acquitted to repentance faith and repentance and holy lives being transformed to be like Christ; and Perseverance of the Saints whereby those he has saved and truly worked in cannot be pulled out of his hand by any force of Satan or shortcoming of their own. Not to use some system that fails to take into account all the points in Scripture to interpret for us whether some doctrine is true or not. Predestination makes little sense to some theological systems, but it must not be thrown out because it doesn't fit a definition of justice that isn't the one defined by Scripture. This is the error I think you have made. Not to read into Scripture some point not actually found in the text because it has to fit our system. Quite frankly this is the error Calvinists are more likely to fall into. 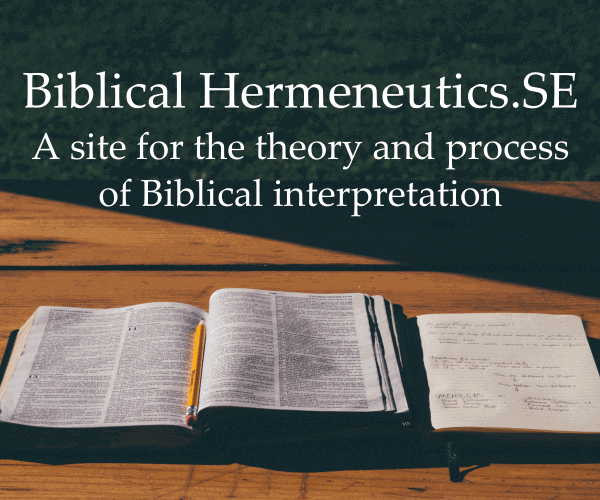 If the interpretive framework fails to shed light on the whole of Scripture or is contradicted by it on any point, one must start over and examine it's presuppositions. I am convinced that the only set of presuppositions and interpretive methods that leads to a framework that can consistently interpret the whole of Scripture is the one that leads to all of these Doctrine of Grace -- yet it is not a perfect system and we must remain humble in the knowledge that our limited understandings of God's works are always going to be flawed in so far as we have not yet been made perfect in glory! Lastly I think it's worth noting that it is impossible to approach Scripture without some interpretive framework. There is no such thing as entirely unbiased reading. Even if the text in question was written in your own time and language, words are meaningless with out certain presuppositions. For example if you fail to presuppose that I wrote this post in English and rather assume it to be Bengali, it will be no more than gibberish. In testing it can be shown that reading the text using English grammar and vocabulary lead to a much more useful understanding. Likewise if we do not approach Scripture with certain assumptions about how it was inspired or is meant to be interpreted as a whole, we will not come away with as deep or true an understanding of it. While these are pre-suppositions (pre because they must be made first and tested later) they can be shown to make more sense when taken together as a whole. Interesting question, user158. I hope we can give plausible answers to your mind. I think that you have been listening to a parody of Calvinism. We have inherited a sin nature from our Adam. We are, by nature, destined for destruction. Instead of sending all to hell, God graciously snatched some away from destruction, at the cost of the life of his own, sinless Son. Calvinists believe that elect infants who died in infancy are saved by God's grace, just like the rest of us believers. (Westminster Confession of faith, X.3). A better question might be, why has God chosen to extend so much mercy to us? We really deserve death and hell. God chose to punish his own Son my place. If there is any injustice that God has displayed, it was in punishing his own Son when I am the one who deserves that punishment. And perhaps most important question of all, user158, is your particular attitude towards the Gospel. It says “how shall we escape if we ignore so great a salvation?” (Heb 2:3) You may have thought that you were a believer at one point in your life. You have heard the gospel of grace. You can't say that God is unjust in giving you the opportunity of salvation through the gospel of his Son. This verse in Hebrews is a plea and a warning. Your willful ignorance of the Gospel will lead to your destruction. It is not God who is unjust. All that the Father gives me will come to me, and whoever comes to me I will never drive away. The first part, "All that the Father gives me will come to me" stresses Predestination, that whoever God chooses will come to Christ. The second part, "whoever comes to me I will never drive away" stresses Freewill: Jesus will never turn away anyone who comes to Him. How do we reconcile these? Apparently we have to hold them in tension, like physicists who accept both the wave and particle properties of light simultaneously (physicists: this is an oversimplification and may be wrong; please forgive me - it's just an illustration :) ). For a more detailed answer, please see How does free will fit with the doctrine of predestination? I am still learning so any feedback would be useful here, but I do think I have some things to add to this discussion. We need to keep in mind that in a technical sense, we are driven to the honest answer that if God chose to Save anyone they will be Saved. Since there is not a direct declaration about unborn children, or those with limited mental faculty, we are left to reason with what we know of His character. Although David committed grievous Sin during his lifetime, God described him as a man after His own heart. 7 Nathan then said to David, “You are the man! Thus says the Lord God of Israel, ‘It is I who anointed you king over Israel and it is I who delivered you from the hand of Saul. 8 I also gave you your master’s house and your master’s wives into your [e]care, and I gave you the house of Israel and Judah; and if that had been too little, I would have added to you many more things like these! 9 Why have you despised the word of the Lord by doing evil in His sight? You have struck down Uriah the Hittite with the sword, have taken his wife to be your wife, and have killed him with the sword of the sons of Ammon. 10 Now therefore, the sword shall never depart from your house, because you have despised Me and have taken the wife of Uriah the Hittite to be your wife.’ 11 Thus says the Lord, ‘Behold, I will raise up evil against you from your own household; I will even take your wives before your eyes and give them to your companion, and he will lie with your wives in [f]broad daylight. 12 Indeed you did it secretly, but I will do this thing before all Israel, and [g]under the sun.’” 13 Then David said to Nathan, “I have sinned against the Lord.” And Nathan said to David, “The Lord also has [h]taken away your sin; you shall not die. 14 However, because by this deed you have given occasion to the enemies of the Lord to blaspheme, the child also that is born to you shall surely die.” 15 So Nathan went to his house. Then the Lord struck the child that Uriah’s [i]widow bore to David, so that he was very sick. 16 David therefore inquired of God for the child; and David fasted and went and lay all night on the ground. 17 The elders of his household stood beside him in order to raise him up from the ground, but he was unwilling and would not eat food with them. 18 Then it happened on the seventh day that the child died. And the servants of David were afraid to tell him that the child was dead, for they said, “Behold, while the child was still alive, we spoke to him and he did not listen to our voice. How then can we tell him that the child is dead, since he might do himself harm!” 19 But when David saw that his servants were whispering together, David perceived that the child was dead; so David said to his servants, “Is the child dead?” And they said, “He is dead.” 20 So David arose from the ground, washed, anointed himself, and changed his clothes; and he came into the house of the Lord and worshiped. Then he came to his own house, and when he requested, they set food before him and he ate. Earlier in the text, it is clear that David is Saved because he is told by Nathan that despite his horrible Sin, it had been washed away by the Lord. So, we know multiple things here. 1) David was Saved despite his Sin, because of the Lord's washing it away. 2) God is the one who killed the child. (God kills 100% of everyone, of course). 3) David, in his response to God's Justified Judgement, makes it clear that he fully expects to one day be with his now dead child. So, the only other things we can go on are the understanding of God's character and how He 'may' apply Election to those in unfortunate circumstances. Again, I cannot speak precisely, only in principle; for lack of direct Scripture on the subject. 22 Then the men turned away from there and went toward Sodom, while Abraham was still standing before the Lord. 23 Abraham came near and said, “Will You indeed sweep away the righteous with the wicked? 24 Suppose there are fifty righteous within the city; will You indeed sweep it away and not [t]spare the place for the sake of the fifty righteous who are in it? 25 Far be it from You to do [u]such a thing, to slay the righteous with the wicked, so that the righteous and the wicked are treated alike. Far be it from You! Shall not the Judge of all the earth [v]deal justly?” 26 So the Lord said, “If I find in Sodom fifty righteous within the city, then I will [w]spare the whole place on their account.” 27 And Abraham replied, “Now behold, I have [x]ventured to speak to the Lord, although I am but dust and ashes. 28 Suppose the fifty righteous are lacking five, will You destroy the whole city because of five?” And He said, “I will not destroy it if I find forty-five there.” 29 He spoke to Him yet again and said, “Suppose forty are found there?” And He said, “I will not do it on account of the forty.” 30 Then he said, “Oh may the Lord not be angry, and I shall speak; suppose thirty are found there?” And He said, “I will not do it if I find thirty there.” 31 And he said, “Now behold, I have [y]ventured to speak to the Lord; suppose twenty are found there?” And He said, “I will not destroy it on account of the twenty.” 32 Then he said, “Oh may the Lord not be angry, and I shall speak only this once; suppose ten are found there?” And He said, “I will not destroy it on account of the ten.” 33 As soon as He had finished speaking to Abraham the Lord departed, and Abraham returned to his place. 5 “Blessed are the [a]gentle (meek, humble), for they shall inherit the earth." We must concede that Election is solely up to Him, that is sure; however, we can also see in principle that His character is reassuring as to how we theorize upon how He decides such a thing. There are no meeker, or gentle souls than those who have not a chance to perform actions; or that suffer from limited capacities. We also should remember, He is ultimately the cause of their existence, their condition, and their death. I hope this provides a sort of reassurance, not that I can claim all lost children go to Heaven, but that we can find comfort in knowing the Mercy aspect of His character. Another alternate, but perhaps less helpful answer to the second question would be in short reply: God is not as you describe. While I'm not at all a fan of Calvinism, I can at least succinctly defend this one point. Note again that I don't necessarily agree with the defense. The problem posed in the question comes down to the default position of humanity. If you realize that everyone, even day old infants, truly deserve Hell and damnation because of original sin, then the idea that anyone is saved at all is a miracle of God's Grace. God appears unjust, but not because some seemingly-innocent are condemned. God is "unjust" because many who are guilty will come to be saved — and even in this case He paid the price for the their salvation through his son. The difference between the two views is that of someone holding your head under water while you drown and of someone seeing many drowning people and saving those who are able to reach up and grab his offered hand. Not the answer you're looking for? Browse other questions tagged reformed-theology grace predestination justice or ask your own question. How could a just God design vessels whose only purpose is damnation, as predestination seems to teach? Why are only some predestined? How do Calvinists argue that limited atonement is just and merciful? How do those who reject both predestination and purgatory justify their beliefs? How does Calvinism explain how an omniscient, omnipotent, and omnibenevolent creator could NOT have a plan for universal salvation? According to Calvinism, why does God give mercy to some and not to others? How can Pharisees turn someone from God if His grace is irresistible? If I seek God, does that mean that I MUST be elect, according to Calvinism? If unconditional election is true do we worship God in vain? According to Reformed theology, does God show special favor to some believers? According to Reformed Theology, why do unbelievers deserve punishment? Calvinists: How to avoid justification from eternity?